Limited understanding of social entrepreneurship and the value it generates can, on occasion, cause business environments to be less than favourable for social entrepreneurs. Given that in addition to profit they (we) have to worry about the impact on people and the planet, this additional complexity means that social entrepreneurs will often have to be more tenacious than other entrepreneurs. They will need to be equipped with a notable set of resources and capabilities, also taking into consideration that the act of accessing capital is much more difficult for them (for more on this check the first article of this series). While it is undoubtedly true that finding funding can be a big challenge – to gain access to it, social entrepreneurs will need to be able to build a strong, convincing case for their business ideas. To do so, coaching and training around business models, legal and regulatory frameworks, access to markets, and many more topics are key. As a matter of fact, the Global Impact Report 2018 – which surveyed social entrepreneurs from 71 Impact Hubs around the globe – found that while 45% of members look for funding opportunities, 52% of them feel the need to learn how to start a project or a venture, 70% are interested in developing their skills and capabilities, and 73% are seeking connections to advisors and experts. 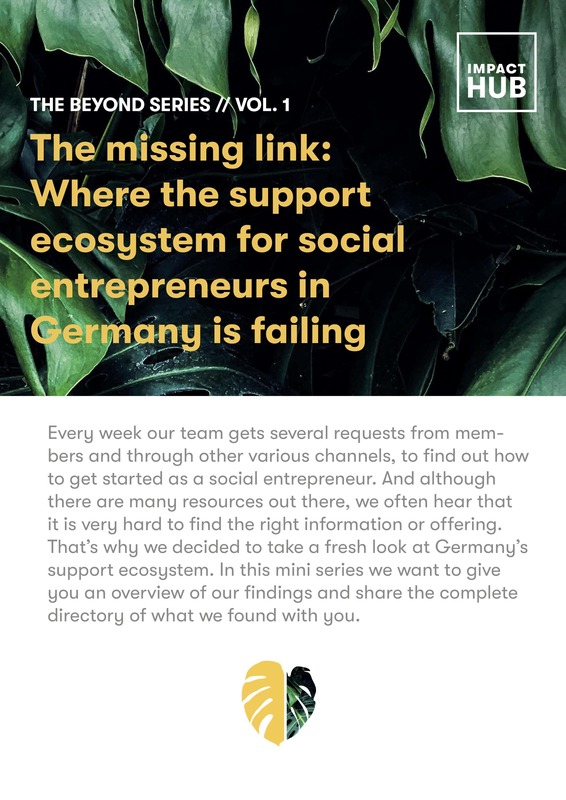 In this article, we want to offer an overview of what is available in Germany when it comes to actually coaching social entrepreneurs on how to set up a social business – who are the key supporters and what forms of assistance are available. Firstly, as social enterprises have needs that are often especially complex and demanding, it is only logical that they also require the support of specialized agencies. In this regard, while we did find numerous offers of formation and consultancy for social entrepreneurs, the number is still fairly limited compared to other sectors and countries. Secondly, as was true for funding, here too we see that the public sector doesn’t carry too much weight, and the largest part of the work is propped on the shoulders of private organizations and foundations. Thirdly, while the number of opportunities for this kind of support in Germany is not extremely high, those opportunities that do exist open their doors to social entrepreneurs from various fields. There are no apparently privileged categories, and the offer ranges mostly from incubation to acceleration programs, coaching, legal assistance, business development and other forms of training. Social Impact Labs. Part of Social Impact’s work is focused on supporting early-stage social entrepreneurs via their Social Impact Labs in 7 cities across Germany. Social startups receive scholarships and qualification programs via various programs like Social Impact Start, which typically include professional counselling, coaching, networking, workshops, and coworking jobs. Investment Ready Program. Investment Ready is a unique 4-month program for entrepreneurs which runs out of Amsterdam, Munich and Vienna. The aim is to support the creation of scalable solutions to societal problems. A cohort of around 15 selected ventures systematically works on their business strategy and builds an attractive investment case. Participants will work with experienced mentors, content experts, investors and powerful business tools. Project Together. Project Together supports young social entrepreneurs from the early phase of their ideas, through a coaching program and an active community of founders and experts. They specifically work to support the achievement of the UN Goals for Sustainable Development. Impact Hub. As part of the biggest global network of social innovators, Impact Hubs provides access to a global community, training and peer to peer support, workspaces, lectures and a variety of incubation and acceleration programs. In Germany there are Impact Hubs in Berlin, Munich, Dresden and the Ruhr Area. All in all, Germany has a number of formation & consultancy programs targeting social entrepreneurs. Nonetheless, in terms of their reach and offering they are still nowhere close to what is at disposal for other entrepreneurs, especially those in the tech space. Even if the regulatory framework and the business environment should become more welcoming towards social entrepreneurs, their challenges still remain quite unique. Thus providing tailored support will be of growing importance to pave the way into the mainstream for social entrepreneurship.